I promised to tell you more about the show and share some of the lovely goodies that came home with me, and so I shall. The whole purpose of going all that way was to make contacts, to meet the people I've come to know online, and to see what I could do to help improve my exposure in the US. To be able to meet yarn companies and stroke their new wares and even bring home some of the loveliness was a real bonus. The following yarns made it all the way across the Atlantic, and each deserves a special mention. I guess it was no surprise that Rowan were there, but their recent decision to be more supportive of independant designers was news. And good news it is too, reflecting the growing change in attitude towards independants and self publishers. Here I snagged some Cocoon, which is a favourite of mine, and Heritage Tweed to experiment with. This beautiful grey, colourway 'Elephant' is hand dyed by the lovely Anzula. It is incredibly soft and much more luscious than this photo would have you believe. I have a very specific design in mind for this yarn, and it won't be long before I'll be casting on. Greys seem to be in this year; I was found to be drooling over several. These 2 gorgeous colours are both from Shibui Knits, who had their booth opposite Deep South Fibers. I fell in love with both of these immediately and was very happy to for them to be mine! 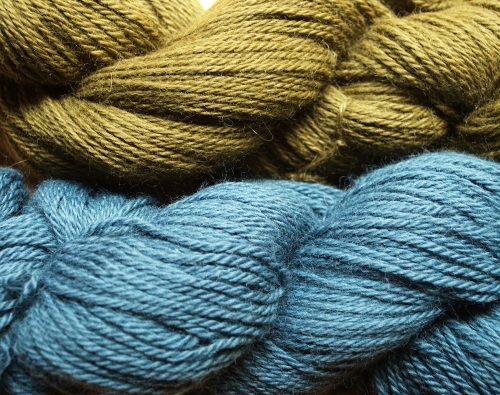 These lovelies are Baby Alpaca DK in colourways Artichoke & Fjord and right now, I can't stop looking at them. Another new to me yarn company, Ewe Ewe yarns, were right next door to the DSF booth and TotToppers Kate kindly introduced me to them. Their Wooly Worsted Washable (and yes, we jested about our different spellings of Woolly!) 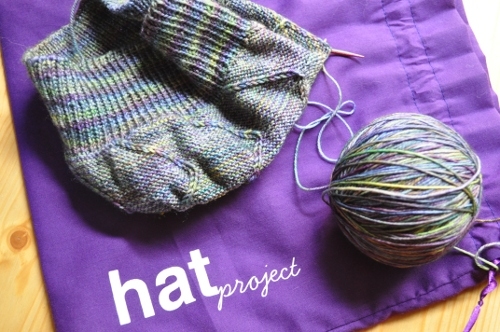 comes in a bright range of colours, absolutely perfect for kids' knits. These 2 are intended for a kiddies Hat, which hopefully will be published later in the year. These 2 yummy yarns are dyes by Aleisha Goes Around, one of the indie dyers I got to meet socially as well as on the floor. You'll no doubt see plenty of photos of her knitter polar bear, which sadly, I failed to take any pictures of. The dusky pink blend is a sock yarn and the green is DK - I did notice an increase in DK yarns, with sock and lace still being the most popular. The fibre content of these 2 makes them rather special, too. This mini haul came from the beautiful Art Yarns. I'd previously spoken with Iris Schreier about creating some designs using her yarns for a book project, so each one of these is has a specific purpose. Luxury doesn't really describe these yarns well enough - these are beyond luxury. I can't wait to start knitting with them, and it was lovely to finally get my fingers on them and meet Iris in person. I was introduced to the lovely folks at Koigu by Carol of Black Bunny Fibers (and Carol can you please thank your friend again for letting me grab these colours from her sample bag?) 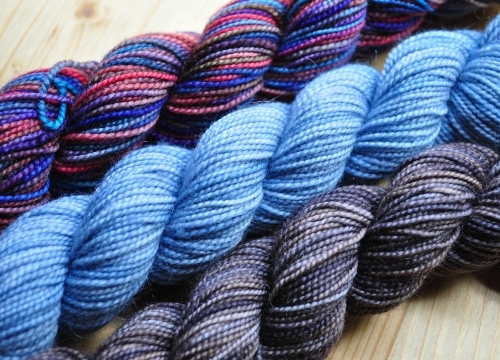 These mini skeins are intended for swatching and possibly publishing something with them. They were really good folks to talk to, and I'm glad I met them. Friday night saw the Designers Dinner, organised by Marly Bird of Yarn Thing, and this do was something else! Firstly, I got to meet so, so many fellow designers all in one go. Infact, a mojito or 3 was needed to get me over my shyness and actually relax, so if you hear tales of me drinking cocktails it was with good reason, K? Seriously, so many amazing people in one room to meet all at once was more than a tad overwhelming. And it was great, ney, fantastic to see everyone there like that. There were needles and stitch markers and tape measures and snips and crochet hooks and badges (US = pins/buttons?) and pens and buttons and yarn samples and audio CDs and books and Soak and Eucalan and more yarn and project bags and even more yarn and, well, **loads** of stuff. Jaws were dropping everywhere as it just kept on coming. Everyone got something different, and there was lots of swapping going on. This was the one gift that had everyone on their knees - each designer received a Namaste bag! I was super happy to swap with TotToppers for this kiddy - I was given a girly pink Monroe and Kate was given this black Urban Messenger - it was the perfect trade and it made me very, very happy! There was of course yarn included in the goody bags, lots of yarn, and these 2 have started talking to me already. These are Debbie Stollers' Washable Ewe, which works to an Aran gauge. This was one of the few Aran weight yarns I came across over the weekend, and you all know how I love this yarn weight so it's not surprising that ideas are forming for this already. It has a nice woolly feel to it, and will give good stitch definition. There was also some Malabrigo Sock in the goody bags and that's already on the needles! And that Della Q project bag is just perfect, isn't it? This was my journey home knitting, grateful that American airlines now see the nonsense in banning knitting needles. At this fine gauge, I got a lot done during my travels and the design is almost finished. Blimey, that's a lot of sponsors, no? There were 65 of us at the Designers Dinner, so these guys really went the extra mile. Here's the deal - I can't keep all of this swag for myself, so a chunk of it is now up for grabs. 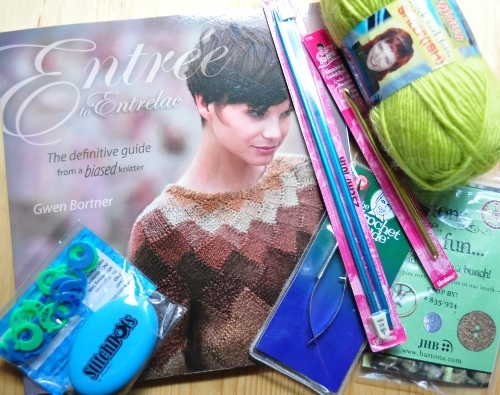 The contents of the photo above - Entree to Entrelac, needles, stitch markers, yarn snips, buttons, crochet hook, etc - plus some bonus goodies (The Knit Kit, badges & buttons and more) could all be yours. There's some great stuff to be had! And I don't mind where I post it all to, so anyone is welcome to enter. All you need to do is to tell me your best sleeping aids or jetlag remedies, because believe me, I need all the help I can get there. It can be something herbal, a favourite recipe or a link to a device that cures all insomniacs. Let's have some fun here, yes? Share with us what you do when you can't sleep, hower ridiculus or sublime it may be. Whoever sends me back to my normal sleep the quickest wins - it's as simple as that! I'll leave the competition open for a week or so, and will close it just before we leave again for England. We'll be driving back in Barp, and once home, I'll post the goodies from there. Don't forget to leave your email address in the required field when you comment, so I can be in touch when you win. Good luck! ETA - this give-away is now closed and new comments will no longer qualify. Thank you so much for your helpful suggestions!